Tie The Knot Returns to Broadway with Exclusive Torch Song BowTie! We are happy to announce our newest limited edition bowtie launching today! The latest addition will honor the triumphant return to Broadway of Harvey Fierstein's iconic Tony-winning play Torch Song. The design will also add the show’s star Michael Urie to Tie The Knot’s extensive list of guest designers. The design will be available exclusively at the Hayes Theater store and online at The Tie Bar, with $20 of every $25 purchase will be donated directly back to Tie The Knot. Drawing inspiration from The Great White Way, the design is both formal and whimsical, perfect for anyone looking to recapture the golden age of formal dressing for the theater. Imagine a new take on the classic black tie look, with just the right amount of pop. The end result is a vibrant new stripe, playful yet elegant – ideal for sitting in the front row or onstage taking a final curtain call. Get your limited edition Torch Song bowtie today and help Tie The Knot support LGBTQ organizations on the frontlines of equality around the world! June is Pride Month and we are excited to launch another collection during this time of celebration for our community. Drawing continued inspiration from the Pride Flag, our newest collaboration with The Tie Bar brings several new pieces. We are excited to introduce two new limited edition bow ties and our first pair of cufflinks designed for Pride! 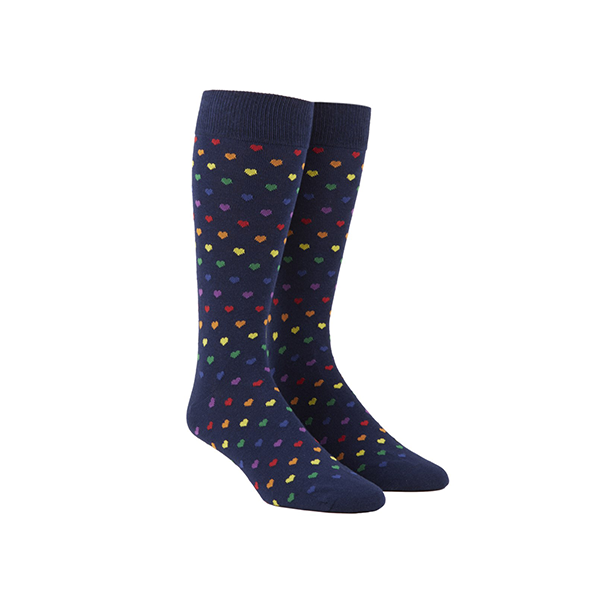 Our Equality Socks and Equality Pin are also back by popular demand! As you know, Tie The Knot has been committed to fighting for LGBTQ equality since its founding, and all our proceeds from this collection will go to an organization fighting on the frontlines of LGBTQ equality. Visit The Tie Bar now and wear your pride! We are excited to announce that we are donating 100% of our profits from the sale of our limited edition bow ties from the Prom Collection to The Fulfillment Fund! The Fulfillment Fund makes college a reality for students growing up in educationally and economically under-resourced schools and communities. This year the organization is celebrating 40 years of empowering young people through the power of mentorship and education. The Fulfillment Fund supports and empowers all students, and is proud of the incredible diversity within the young people they serve. Through a wide array of unique and innovative programs, The Fulfillment Fund transforms individual lives while creating a ripple effect through the entire community. Harnessing the power of mentoring, classroom instruction, one-on-one college counseling and experiential learning opportunities, they open young people’s eyes to the possibility of higher education, and change their beliefs about what they are capable of achieving. The Fulfillment Fund's partnership with Tie the Knot began three years ago. Thanks to them, two of our the Fulfillment Fund's LGBT students were granted scholarships for college that made a huge difference in their ability to succeed. 20$ of every $25 Tie The Knot purchase is donated to frontline organizations fighting for LGBTQ equality. All profits raised from the sale of our Tie The Knot collection this month will be donated directly to the Fulfillment Fund. We are excited to announce that we are donating 100% of our profits from the sale of our limited edition bow ties through December 31st to OutServe-SLDN! For nearly 25 years, OutServe-SLDN has been dedicated to bringing full LGBTQ equality to America’s military and ending all forms of discrimination and harassment of military personnel on the basis of sexual orientation and gender identity. They provide free and direct legal assistance to servicemembers and veterans affected by the repealed Don’t Ask, Don’t Tell (DADT) law and the prior ban on open service, as well as those currently serving who may experience harassment and discrimination. OutServe-SLDN led the fight to repeal DADT, has represented over 12,000 service members, and provides a community for over 25,000 active members through their 80 local chapters around the globe. Now, with the current administration’s attempt to ban transgender military service, OutServe-SLDN has been leading the legal battle to protect transgender servicemembers. Your support will help them prepare for the legal battles ahead, as well as help servicemembers discharged as a result of their sexual orientation have their record cleansed so they can finally have their service characterized appropriately and access the veterans’ benefits they’ve earned. 20$ of every $25 Tie The Knot purchase is donated to frontline organizations fighting for LGBTQ equality. All profits raised from the sale of our Tie The Knot collection this month will be donated directly to OutServe-SLDN. June marks a time of celebration, reflection, and recommitment to progress for the LGBTQ community: Pride Month. We at Tie The Knot are excited to celebrate this joyous time with a new collaboration with The Tie Bar. We've launched our first ever lapel pin and socks in support of LGBTQ equality! Introducing the official Equality Pin, Equality Sock, and Signature Owl Sock! As you know, Tie The Knot has been committed to fighting for LGBTQ equality since its founding, and our signature owl logo - a symbol of wisdom and foresight - has been helping us win each battle in the cutest way possible. Tie The Knot Launches the Official James Beard Bow Tie! We are thrilled to announce that Tie The Knot co-founder, Jesse Tyler Ferguson, will be hosting this year's James Beard Awards on May 1 at the Lyric Opera Theatre in Chicago! To celebrate, we are launching the official James Beard bow tie with proceeds being donated to the James Beard Foundation in support of diversity and LGBTQ inclusion in the culinary community. Last month, we launched our Just Love Campaign, which was designed to simply-- celebrate love! As divisiveness and anger plague our country, we thought there was no better time to launch this campaign. Our goal was to directly engage with our followers, and remind the world to embrace a message of love. We hope you enjoyed this campaign as much as we did! At the same time, we also launched our best selling collection, the bow ties that YOU loved the most! The season’s guest designer was Joanna Coles who created a one-of-a-kind bow tie to support the organization. “I couldn’t be happier to partner with Jesse, Justin, and Tie the Knot to further advance equality for the LGBTQ community," said Coles. "Using my love of fashion to help ensure that everyone in America is treated with dignity and respect is an opportunity I could not pass up." Check out our collection!